When HCC art professor Mac McAvoy was a kid, he didn’t have much interest in school. His mind often wandered to more important things such as Star Trek and the latest hits from rock bands like KISS. Perhaps contributing to his lack of interest in academics was McAvoy’s dyslexia, a disorder that makes learning to read difficult. Eventually, while still battling dyslexia, he also found a passion for reading. The first book he read on his own was The Phantom Tollbooth by Norton Juster. In the book, main character Milo is bored by the world around him. One day, he unexpectedly receives a magic tollbooth and drives through it in his toy car, setting him up for numerous adventures. Fast forward several years. Bringing together art and his love of literature, McAvoy has created a series called The Classics. The pieces represent literature from the horror and science fiction genres and include art inspired by books like Frankenstein and works by H.G Wells. The latest in his series, iRobot: If you prick us, do we not bleed?, is based on the first story from Isaac Asimov’s, I, Robot published in 1950. In it, a young girl prefers to spend time with her nanny-robot over anyone else. McAvoy recently re-read the book as an adult and noticed parallels to today’s culture. With that curiosity, McAvoy used his sabbatical during the fall 2016 semester to create iRobot. The “not quite finished” product is a unique mix of art and technology. He sculpted the torso and head of a human figure out of polyester resin. 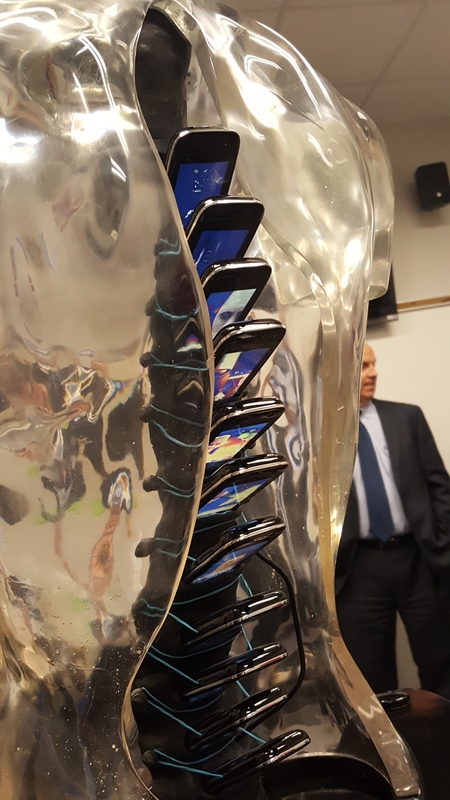 The sculpture’s spine is made of cell phones that display videos of robots through the ages. The head contains a Nook digital tablet where images of a real person’s face gives various facial expressions. Atop the Nook is a camera that allows the head to focus on individuals and look at them as they move around the room. In addition to representing our reliance on technology, I, Robot is about robots taking over the world. “One of Asimov’s laws of robotics states that a robot cannot let a human come to harm through inaction,” explains McAvoy. “So, if a human is being harmed, the robot needs to step in and help. With things like racial tension and environmental harm, we as humans are currently doing lots damage. 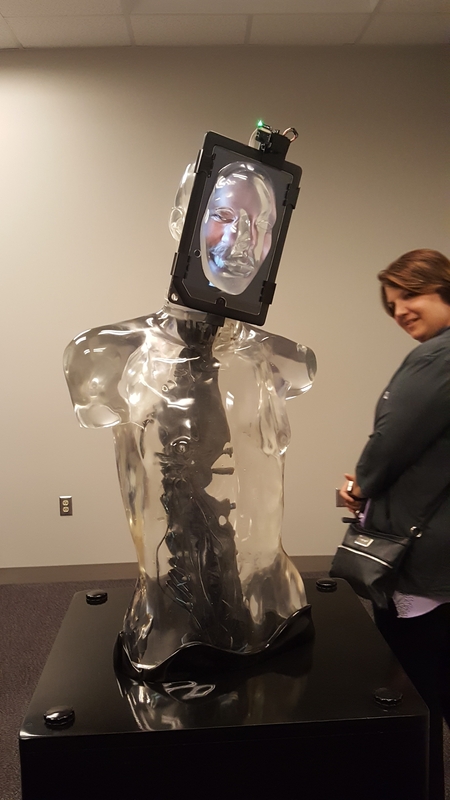 My piece represents Azimov's novel and the videos on the tablet bring the book to present day by pointing out reasons why robots would need to take over the world." To signify what McAvoy describes as “the ugliness of the world,” he wants to include images of war, civil justice and other elements on the sculpture’s face. He also wants to record more facial images and is inviting others to join through Facebook.